Enzo Maccarinelli wants a rematch with Jurgen Brahmer after losing to the WBA light-heavyweight champion in Rostock on Saturday. The Welshman's right eye closed after a clash of heads in the first round. Southpaw Brahmer, 35, took full advantage and Maccarinelli was pulled out by trainer Gary Lockett at the end of the fifth round. "I'd like to do it again. What can I do? I had one eye, he had two," said the 33-year-old from Swansea. "I'm not going to say I would have won but I do believe it would have been a different story, a lot harder for him [without the eye closing]. "That's boxing isn't it - southpaw against orthodox, a clash of heads. I thought he came off worst but my eye started swelling straight away and then he caught me on it." 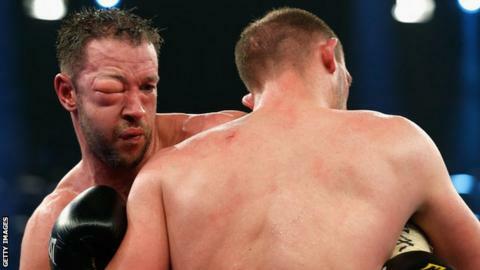 Maccarinelli could not see out of his damaged eye by the end of the first round but did not tell Lockett as he knew the fight would be stopped sooner. "I gave myself a bit of a chance but I thought they were going to stop it straight away," said Maccarinelli. And the former WBO cruiserweight champion believes he showed enough against Brahmer to merit another shot at the German's title. He said: "He hit me flush on many occasions and I don't think he hurt me once. He is a big puncher. Nothing bothered me power-wise, but I couldn't see him." The defeat was Maccarinelli's seventh in 45 fights, but he did not criticise Lockett for calling an end to the contest. He said: "I was willing to go till the end but that's Gary's job, he's trained me well. What's disappointing is we've trained so hard, I really believed I could have won."